*Prices with an asterisk shows Non-Refundable Deposit fare. A fee of USD cancellation or change fee per guest applies. Price is per person, in USD, for cruise only on select sailings and stateroom categories, based on double-occupancy, reflects any promotional savings, and is subject to change and availability. Taxes, fees, and port expenses are additional. Price includes non-commissionable cruise fare. Additional restrictions apply, including the terms and conditions of any promotions and pricing programs. © 2019 Celebrity Cruises Inc. Ships' Registry: Malta and Ecuador. Rates are per person based on 2 per stateroom/rates for 3rd/4th guest on request. Port charges $181.08 per person additional. Other stateroom categories on request. 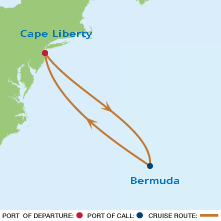 Choice of 1 perk per stateroom - $300 onboard credit-free wifi-prepaid gratuities-classic beverage pkg. Deposit $500.00 per stateroom.